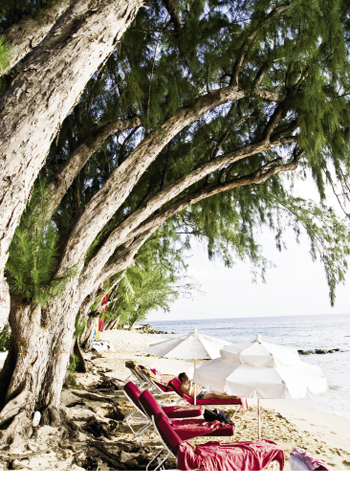 The pink-painted and -upholstered Sandy Lane Resort—a favorite hideaway of Jackie Onassis, Queen Elizabeth, Sidney Poitier, and Jennifer Lopez—celebrates its 50th anniversary in 2011. 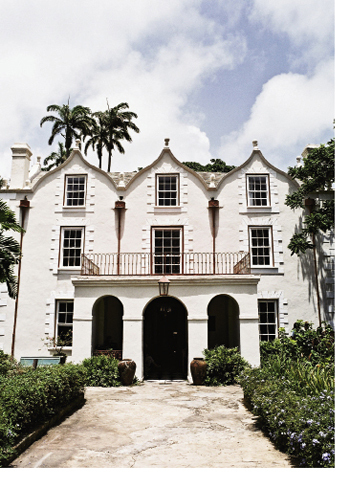 Newly renovated with interactive exhibits on the island’s seafaring history and plantation culture, the sparkling white Arlington House Museum in Speightstown is often touted for its “single house” architecture so reminiscent of Charleston. 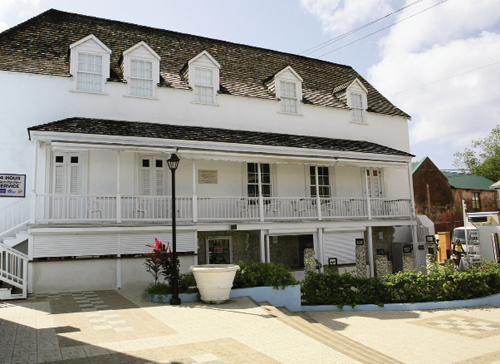 Some historians say the narrow homes with gables on one side are a form that originated in Barbados. Stays at the Colony Club, which is set on seven beachfront acres, include access to four lagoon pools and free use of boogie boards, kayaks, and other water-sports gear. 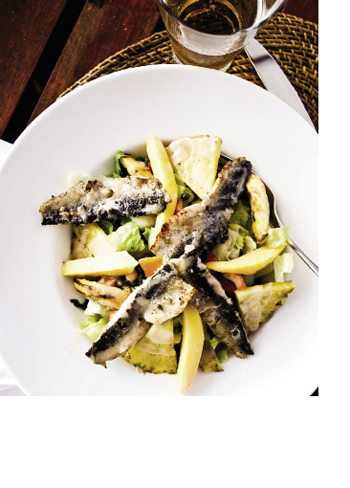 A salad version of the national dish, flying fish and cou cou, is served beachside. One of the 17th-century owners was John Yeamans, who sent some of the first sailing ships to the Carolina colony, built a plantation near Charleston, and was appointed Governor of Carolina. Yeamans was also accused of arranging the murder of his business partner, Benjamin Berringer, in order to woo and marry Berringer’s wife and take his plantation (St. Nicholas Abbey)—which Yeamans did. The great house (far left) is a mansion of Jacobean architecture; and the house, grounds, and rum tasting room are open for tours. 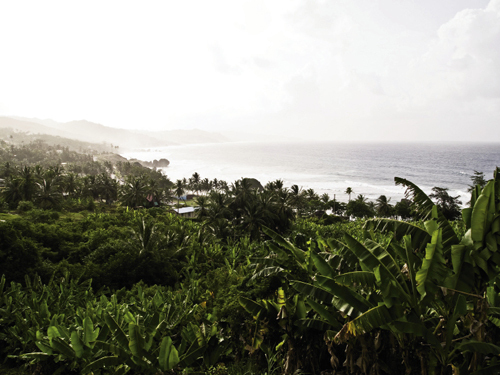 Barbados is hilly but not mountainous or volcanic, with its tallest peak, Mount Hillaby, at a mere 1,115 feet. High season runs from mid-November through April, while June to November are the rainiest months. 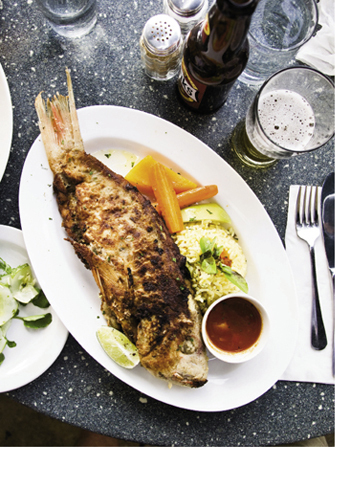 Whole fried snapper and a Banks beer at the Waterfront Café (top), where you can sit near bobbing sportfishing boats and the namesake bridge of Bridgetown. 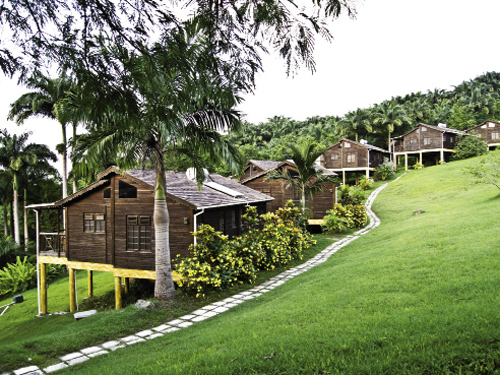 In the island’s interior, Lush Life Nature Resort’s cottages and the Caribbean restaurant Naniki are clustered on a secluded hilltop fringed by the rainforest. 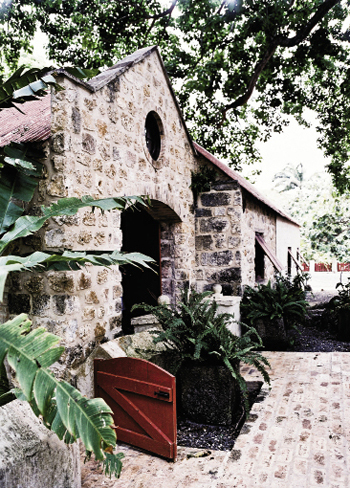 Once a tangle of refuse and vines, a gully in the island’s interior has been transformed by Barbadian Anthony Hunte. 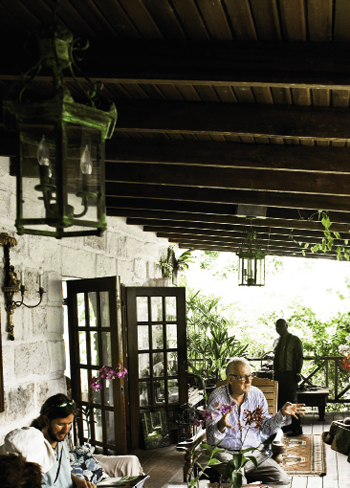 After touring the private garden pathways, visitors are invited to linger on the porch of Hunte’s home for cocktails and conversation. 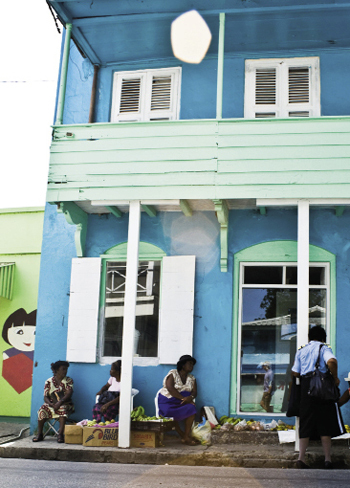 Brightly painted wooden buildings (opposite) line the streets of historic Speightstown to the north, while buzzing Bridgetown, to the south, is the largest city. To drive between the two is to see the gamut of island scenery: urban streets, laid-back beach cafés and bars, trendy boutiques, upscale restaurants, simple inns, and gated resorts. Our driver is listening to a cricket game on the radio as he winds us past sugarcane fields and a hilltop rum factory. We’re in the middle of the bell-shaped island of Barbados, the longtime colony and still British darling of the Caribbean, complete with parishes, parliament, and salt cod on the menus. Set at the southeastern end of the island chain, Barbados is not quite a tropical England, but travelers from Britain, as well as Australia and Canada, flock here. 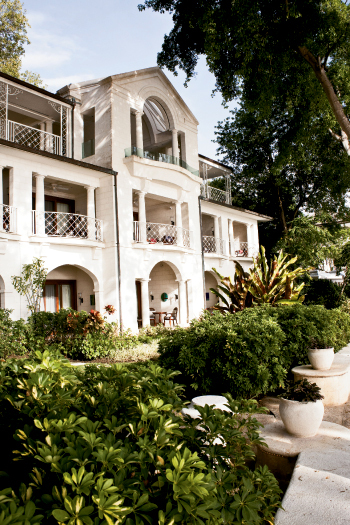 And for Charlestonians, the West Indies isle has an often-familiar feel, born of a shared history. During our stay, we were reminded of home again and again, even though it’s been a few centuries since Barbadian planters landed in Charles Towne. At the Arlington House Museum on the northwest coast in Speightstown, displays note that the bright white building “closely resembles the single houses of Charleston.” (You can almost check its features off a list: east-west orientation, one-room width, a side porch.) 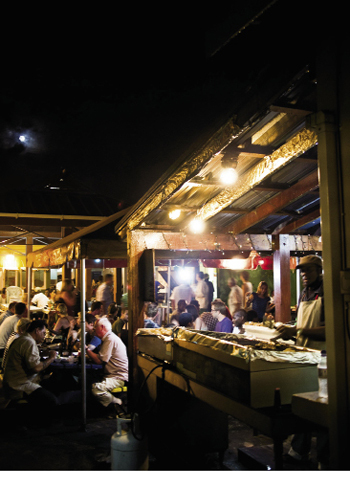 Island menus include plenty of fish, rice, and okra, and streets have names such as King, Queen, and Bay. Then there are the “chattel” houses of aqua blue, sunny yellow, and parchment white. From simple to ornate, these moveable homes of late 19th- to early 20th-century island sharecroppers look much like our city’s freedmen’s cottages. 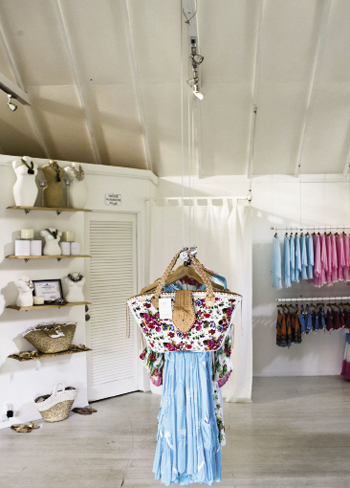 Still, Barbados remains exotic, different from Charleston in the ways a tropical islandcan be. Average temperatures are in the 70s and 80s year-round. 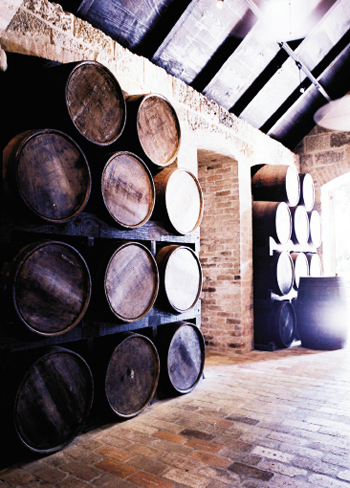 Sugarcane still grows, and molasses and rum are key exports. 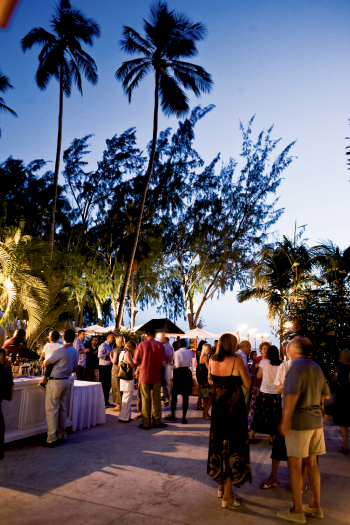 Resorts near Bridgetown and on the west coast offer gated opulence not far from racetracks and dance clubs with crowds and thumping beats that spill onto the street. The social life is particularly active in winter, with many options for luxury. On this trip, our home away from home was the Colony Club on the west coast near Holetown, situated down an avenue of tall mahogany trees that ends at the shore. 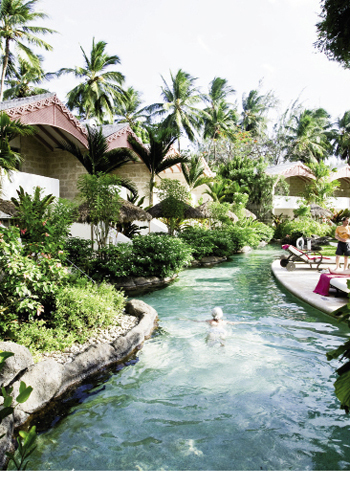 Under palm and casuarina trees, the villas and rooms open to lagoons edged by coral stone. (The island isn’t volcanic, rather it rises from the ocean atop a giant mass of coral.) Here, everyone knows how to relax. Rum drinks and ice-cold washcloths are offered to guests at check-in, and it doesn’t take long to get into the island pace, change into looser clothes, grab a towel. Within an hour of arrival, we were at the hotel’s open-air restaurant, trying our first flying-fish salad with mango and pineapple. It was a resort version of the national dish, flying fish and an okra and cornmeal mixture called cou cou. (Fish and grits, anyone?) A few yards away, a slim 60-something woman in a blue-and-white-striped bikini and skin tanned to a tobacco color reclined on a chaise. She’d be there morning to late afternoon the next two days as well, each time in a different suit. A handsome young couple waded up to the stools at the swim-up bar. 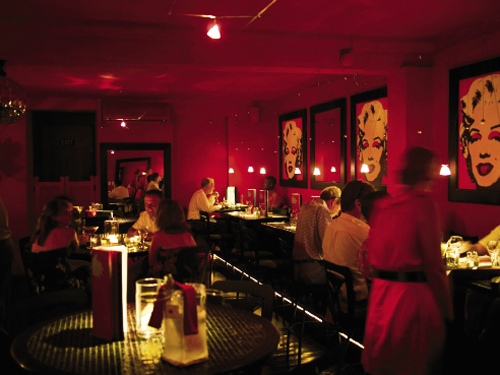 The people-watching had begun—and it would prove quite interesting. We didn’t see any celebrities, but the west coast is often touted for its well-heeled (or well-flip-flopped) glamour. At nearby Sandy Lane Resort, where room rates begin around $2,000 per night, guests over the decades have ranged from Jackie Onassis to Mick Jagger to Tiger Woods. Just 21 miles long and 14 miles wide, the island is manageable for exploring but doesn’t feel too small. The next day, we toured St. Nicholas Abbey, an elegant Jacobean mansion and plantation tract that dates to 1658 and was recently reinvigorated by new owners, who have also brought sugarcane rum back into production. 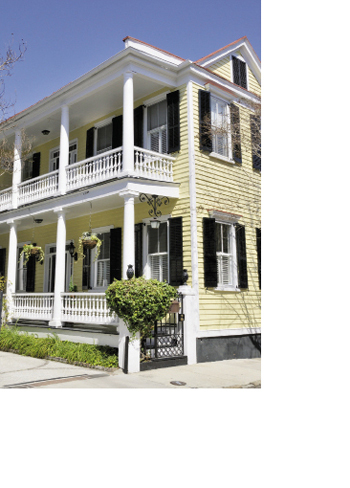 The property has a strong Charleston connection: one of its 17th-century owners was John Yeamans, who was appointed Governor of Carolina by King Charles II. 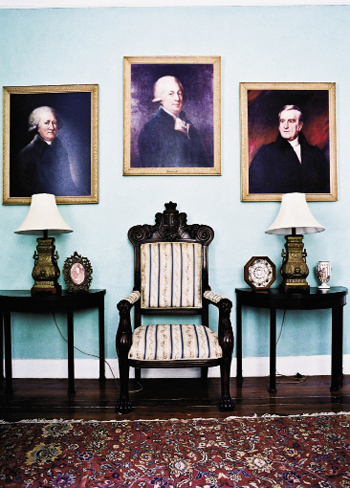 The Royalist lived for a time in Charles Towne, establishing Yeamans Plantation—part of what is now Yeamans Hall in Berkeley County. Barbados’ history then becomes our history, as Yeamans is also thought to have been the first to bring enslaved people to Carolina. The Barbadian plantation culture would become firmly rooted in the Lowcountry. 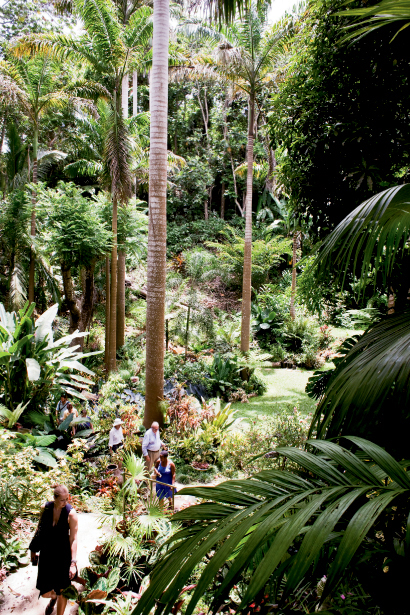 We later stopped by the Lush Life Nature Resort and met the owner, Tom Hinds, who was waist-deep in anthurium flowers. 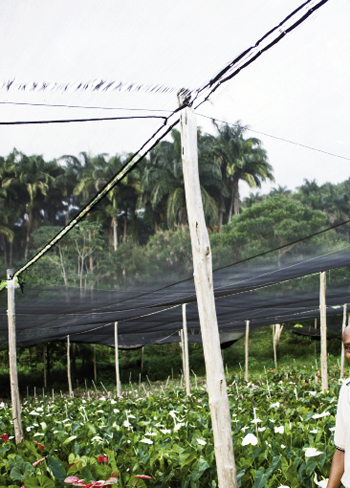 He cultivates thousands of the tropicals in a hillside greenhouse. And we crossed over to the less-visited east coast to see the famed “Soup Bowl,” where surfers ride waves over rough coral. 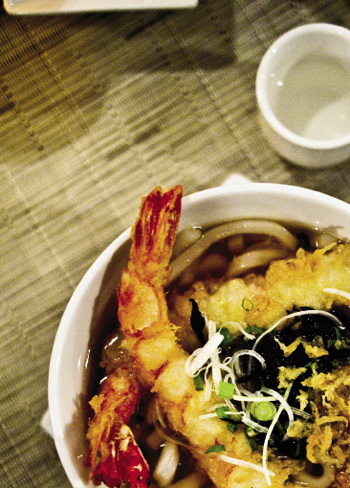 The century-old Atlantis Hotel, known for its authentic menu, is just down the shore. You don’t have to hire a driver in Barbados, but with the British left-side right-of-way, it helps. All of our driving was ably done by Wayne Cox, a lifelong Barbadian. He’d fill us in on the cricket game score (the West Indies lost to South Africa), point out the historic houses, and talk of some of his favorite local dishes: rice and peas, green bananas and fish, yam pies, and fish pies. Roads can be stomach-tumbling rough in places in the hilly interior, and landmarks are used for directions more commonly than signs. But there was a handmade one that kept coming up, a small paintedarrow for Hunte’s Gardens. 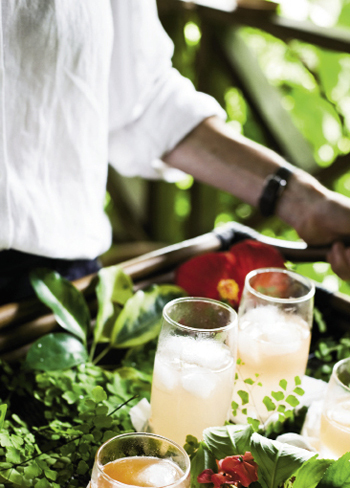 The garden’s owner, horticulturalist Anthony Hunte, soon appeared, and after a casual tour along the pathway of orchids and bromeliads, he invited us, along with a couple from Canada, to join him on his porch for our choice of rum punch cocktails or lemonade-tinged amber with bitters. Barbados is quite the island. We didn’t return for daiquiris, but that night at sunset, I thought how somewhere west and north on the Atlantic shore stands Charleston—distant, yet so very near. Visit in the high season from mid-November through April, while the galleries, shops, and social season are in full swing.